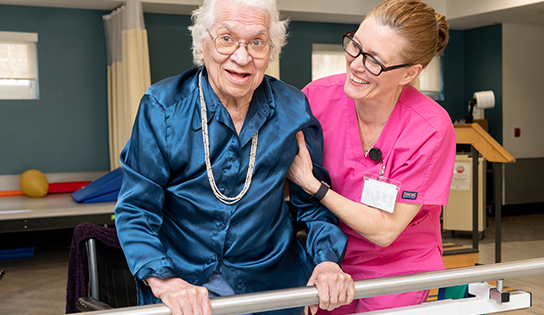 Ms. Bowen was admitted to The Phoenix Rehabilitation & Nursing Center on March 20th, from Acute Care Hospital, located in JFK Medical Center, for rehabilitation after diagnosis with anemia. Ms. Bowen also had muscle weakness and difficulty in walking. She did not have bed mobility when she arrived to The Phoenix. Ms. Bowen started her rehabilitation with a baseline in walking the distance of 10 feet in the first week. Along with physical therapy, she also had occupational therapy, which helped her with activities in daily life. She also met with the concierge and the recreational team who was there to provide the highest quality services for her. Ms. Bowen said the place was “very nice” and was very appreciative of the all the support she got. During the second to last week, she was able to improve her walking distance increased from 10 feet to 75 feet in CGA surface level. While she was here, the nursing staff and the recreational team treated her very well. The concierge would also check on her from time to time and bring her gifts, such as mugs and notepads which made her very happy. She was encouraged to get better and received a lot of support. She did not have any issue with bed mobility by the time she was ready to leave during the few last weeks. Ms. Bowen was discharged on April 19th to her home. She had achieved the highest practical level from her therapy and the distance she was able to walk was 90 feet SBA. It was a very impressive achievement, from 10 to 75 to 90, and we are very proud of her. Congratulation and best of luck, Ms. Bowen!